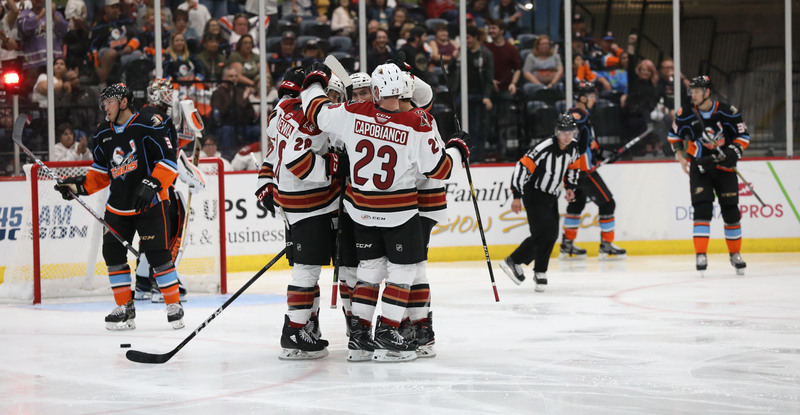 Four unanswered third period goals catapulted the Roadrunners to a 6-4 victory over the San Diego Gulls Saturday night in front of 6,327 at Tucson Arena, the first opening night win in franchise history. Despite falling into a two-goal deficit in the opening minutes of the contest, the Roadrunners clawed back, matching the Gulls’ scoring thereafter until exploding with an offensive outburst during the final frame. With 8:33 remaining in the first period, Jens Looke shoveled home the Roadrunners’ first goal of the season from out front, cutting the Gulls’ early two-goal lead in half. San Diego responded quickly, tacking on their third of the night to re-up their lead to 3-1. Looke deposited his second goal of the evening with 3:49 to play in the opening frame, finishing off a two-on-one sequence with Laurent Dauphin to once again get the Roadrunners to within a goal heading into the first intermission. The Gulls would strike for the only goal of the second period, taking a 4-2 lead into the third. 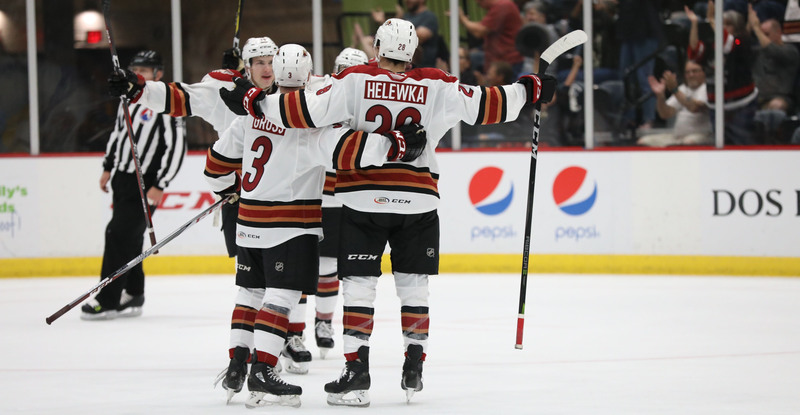 Less than a minute into the third, Adam Helewka beat San Diego’s Jared Coreau with a wrist shot from the slot, netting his first goal in a Roadrunners uniform to cut the score to 4-3. With 10:21 remaining in regulation, Helewka buried his second of the evening, tying the game 4-4 when his one-time slap shot from the top of the right circle trickled through Coreau’s pads. A mere 35 seconds after Helewka’s game-tying tally, the Roadrunners claimed their first lead of the night when Matteo Gennaro, who was playing in his first professional game, beat Coreau with a wrist shot high to the blocker side from just inside the blue line. Laurent Dauphin provided insurance, tacking on the Roadrunners’ sixth goal of the evening when he batted a puck out of mid-air and into the net amidst a scrum in San Diego’s crease. The Roadrunners outshot the Gulls by a 44-20 count. Adin Hill made 16 saves, earning his first win of the season. Five players finished the night with multiple points: Robbie Russo (2A), Laurent Dauphin (1G, 1A), Lane Pederson (2A), Adam Helewka (2G), and Jens Looke (2G). These teams will meet again Friday night at the Valley View Casino Center, where the puck is scheduled to drop just after 7:00 pm PST.